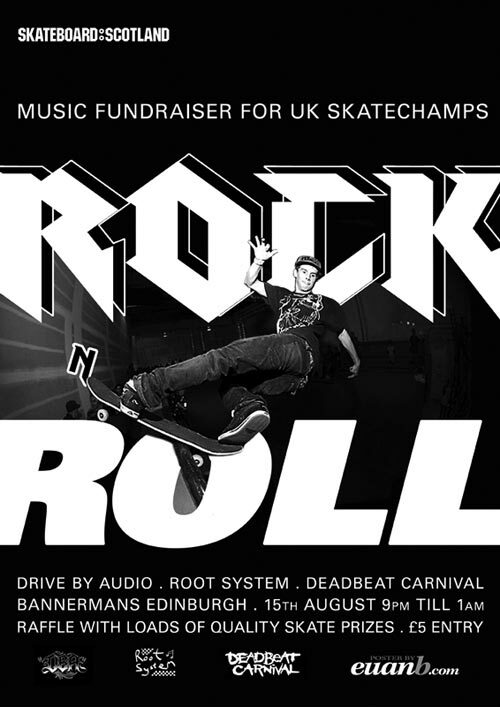 To help raise some cash towards the UK Skatechamps Skateboard Scotland are holding a fundraiser event. The event is at Bannermans in Edinburgh on the evening of August 15th, perfect opportunity for a night’s entertainment after the Fundee Skate Jam in Dundee during the day and before the Perth Skate Jam on the following Sunday!!! The bands playing are: Drive by Audio, Root system and Deadbeat Carnival. Come along and be entertained, but also get a warm fuzzy feeling as you’ve contributed to the continued running of one of the UK’s top skate events. Doors open at 9pm until 3am, £5 to get in. There will also be a raffle with a bunch of quality skate prizes.